The Temple of Athena Polias was rebuilt in 334 BC as a gift from Alexander the Great and was a standard Ionic structure with eleven columns along its sides, six at the ends and two in antis. 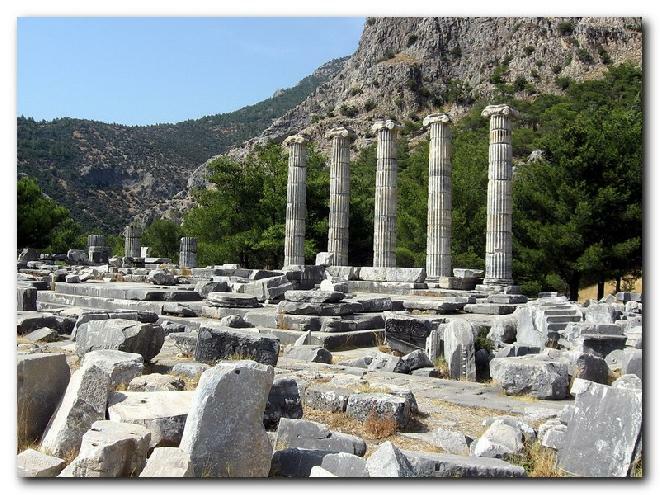 Athena Polias was the goddess of Priene and protectress of the city. The proportions of this temple were taken as a classical model or pattern by the Roman architect Vitruvius. The architect of the Athena Temple was Pytheos who also built the Mausoleum at Halicarnassus, one of the Seven Wonders of the ancient world. Uploaded by slavica on 5/4/2009, viewed 6635 times.